The proposed repeal of SB 1 would threaten funding for road and transit improvements across California. Photo by flickr user Sergio Ruiz. The passage of Senate Bill 1, the state transportation funding bill, in April of last year, represented a monumental win for California and the Bay Area. Not only is it on track to solve big problems for cities and transit agencies across the state, it has shown that California can raise significant funding for transportation in an era of dwindling federal resources. But this victory may have been short-lived: Proposition 6, a ballot measure to repeal SB1, will go to California voters in November. A repeal of the hard-won gas tax (the first tax increase on gasoline in 23 years) threatens transit and road improvement projects that receive funding through the tax. The focus of SB 1 is very much on roadway maintenance rather than roadway expansion. And while it’s been called a “road bill,” public transit receives more than 10 percent of the annual funds. A repeal of the bill is a vote against safe streets, roads and infrastructure in favor of greater subsidies for driving. SPUR is emphatically against such a misguided move. SB1 raises an enormous amount of revenue for the state — over $5 billion per year in perpetuity, equivalent to a 45 percent increase over current state funding levels. Transportation advocates and local elected officials had for years tried to get the message across that over two decades without a gas tax increase had created a $130 billion backlog in needed repairs and improvements. It finally worked: SB1 passed in 2017 by more than 67 percent in both the assembly and the senate. Proposed by a Republican congressional delegation and Republican gubernatorial candidate John Cox, Proposition 6 proposes requiring voter approval for any new gas tax increase. It’s also retroactive to the beginning of 2017, which would effectively kill the new fees created with the passage of SB1 last year. The bill’s $5 billion per year funding would cease at the end of the current fiscal year. Projects that haven’t yet begun construction would have to be canceled, scaled down or delayed indefinitely. Carl DiMaio, the San Diego Republican who is spearheading the repeal effort, was quoted in the Los Angeles Times as saying, “If we want to fix our roads, we don't need to raise taxes to do it.” DiMaio did not, however, point to a source for those funds. It’s not clear what’s elitist about spending $5 billion annually to make road safety improvements, ease traffic congestion, fill potholes, invest in public transportation throughout the state, and repair local streets, freeways, tunnels, bridges and overpasses. 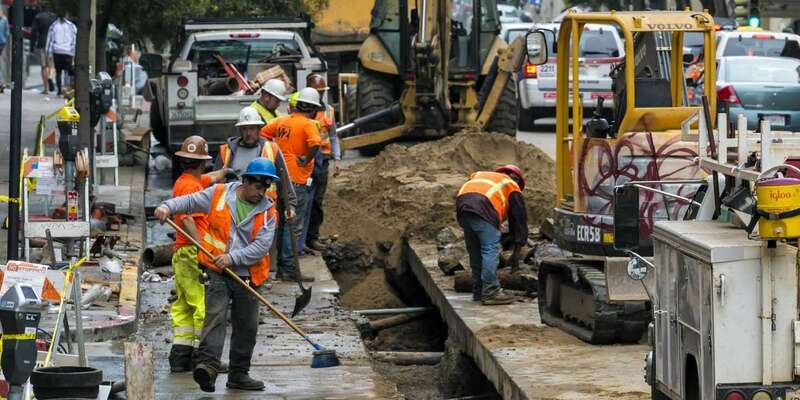 A report issued earlier this year by the American Road and Transportation Builders Association (ARTBA) found that the economic impacts of SB 1 would be significant and would reach every single community in California. How significant? The analysis calculated the 10-year economic impact at $183 billion in economic activity, including supporting or creating 68,000 jobs a year. Like Governor Jerry Brown, the California Chamber of Commerce, cities, labor unions, environmental groups and countless others against the repeal, SPUR believes strongly in the necessity and importance of SB1 and urges voters to oppose California Proposition 6. You can learn more, volunteer and get involved in the campaign to defeat Proposition 6 by visiting NoProp6.com. Would a Majority Approve Repeal?